The rain was still with us when we awoke at the Aire des Deux Caps. It eased off and eventually stopped shortly afterwards, though. One of the reasons we like using this service area, apart from its proximity to the ferry port, is that it has decent washing facilities and a reasonable cafe for that first French breakfast of coffee and pain au chocolat. Now we know we’re in France. Suitably refreshed and awakened, it was time to figure out what to do. If the ports are being blockaded there could be fuel shortages developing. We could stay in Normandy within one tank’s worth of the channel ports until we know what’s going to develop. Why though? Do we want to spend a long time in Normandy? Pleasant though it is, no. Anyway, there will be countless other folks dans le même bateau, will there not? We’re here for 6 weeks, for Christ’s sake; the French government surely couldn’t let fuel problems persist that long. Utter anarchy would result. (Come to think of it, that sounds very French.) On with plan A and see what happens. We had an irritating head wind which negated a lot of any potential benefit from down hill sections and the Calais – Rouen autoroute is very hilly so we were sucking down very expensive diesel at an alarming rate. We’d never make the 300 miles on a tank like this. We filled up at the last autoroute service station before Rouen, though, and that gave us the range to get to Huisseau-sur-Cosson, just south of Blois on La Loire, passing all those closed fuel stations. Today was exceptionally quiet. This was quietness redefined. Having left Rouen, we headed directly south to Blois and almost had the road to ourselves. Occasionally a vehicle would pass us going north or overtake us going south but, for the most part, we were alone – literally not a car in sight. This never, but never, happens in England, not even at 2:00 AM. It was so quiet, it was eerie. Had everyone else been incinerated in a nuclear holocaust? Someone had suggested the locals are just not driving much because of the fuel prices. Maybe it’s true. 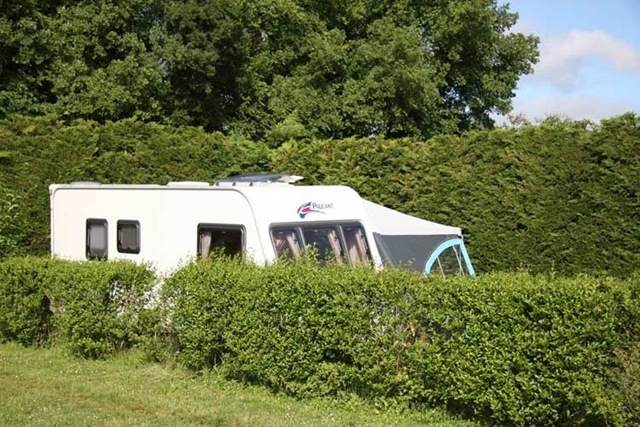 After a blissful drive, albeit struggling against an adverse wind, and a brief pause for a bite of lunch, we pulled into our camp site at Huisseau-sur-Cosson at about 3:00 PM – five minutes before a Dutch caravan. This is unusual. Our fortuitous timing enabled us to snaffle the currently unoccupied prime pitch on the edge of the site with views over the corn fields under the occasional circling buzzard. A lot of nifty caravan reversing was required but we got in and Billy settled down very happily indeed. We’ll be comfortable here and can cycle to our hearts content for absolutely everything. This is shut a pleasant part of France, I could happily live here so any length of stay is no hardship. Let’s see what happens.